(Phys.org) —Physicists at ETH Zurich have demonstrated one of the quintessential effects of quantum optics—known as the Hong-Ou-Mandel effect—with microwaves, whose frequency is 100'000 times lower than that of visible light. The experiment takes quantum optics into a new frequency regime and could eventually lead to new technological applications. Quantum mechanics, famously, is full of effects that defy our basic intuition. A fine example is the Hong-Ou-Mandel effect, which occurs when two light quanta (or, photons) arrive simultaneously at a so-called beam splitter. As its name implies, a beam splitter is a device that splits one beam of light into two, by transmitting one half of the impinging light and reflecting the other half. For a single quantum of light, a photon, this means that it has a 50-percent chance to appear on either side of the device. But when two photons arrive at the same time at the splitter, something unexpected happens: The photons then always emerge as a pair on the same side of the beam splitter, either both on one side or both on the other side. Never do the two photons exit on different sides. This counterintuitive effect has been first demonstrated in 1987 by Chung K. Hong, Zhe-Yu Ou and Leonard Mandel using laser light. The experiment has been repeated many times since, but all of these demonstrations use photons in the optical range (which is the frequency range of visible light). Andreas Wallraff, a professor at the Department of Physics, and his co-workers now break out of this regime and demonstrate for the first time the Hong-Ou-Mandel effect for microwave radiation, at frequencies around 100'000 times below those of a typical laser. Even if there is no fundamental reason to believe that quantum theory would make a distinction between "microwave photons" and "optical photons", this demonstration puts this equivalence across a huge frequency range on a firm experimental footing. Moreover, the lower frequency of the microwave photons enabled a more complete characterization of the effect than has been able so far with optical photons, opening up new possibilities to characterize radiation sources. Finally, the new experiment highlights how quantum optical effects can be exploited in experiments with microwave sources, which may lead to practical applications of "microwave optics". Wallraff and his team used microwaves whose frequency is comparable to that of a common microwave oven. Their source of microwave radiation, however, couldn't have been more different from a household device. 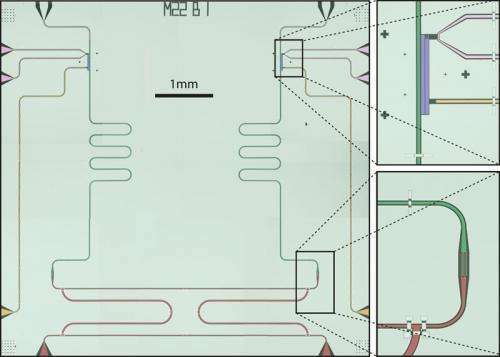 The scientists use microfabricated millimeter-sized circuits for generating microwaves that come in single photons. "We can generate individual microwave photons on demand, whenever we need one ," says Christopher Eichler, scientist in the Wallraff group. This is something that is not easily achieved with single-photon sources in the optical regime. Whereas a laser can be conveniently turned on and off, optical single-photon sources typically involve intricate processes that are much harder to control. The microwave sources have also the advantage that their frequencies can be accurately tuned, such that two independent devices produce photons at the exact same frequency. This is a prerequisite for observing the Hong-Ou-Mandel effect. In the experiment of Wallraff and his group, the microwave photons indeed displayed the counterintuitive behavior predicted by theory. Whenever two photons reached the beam splitter at the same time, they left it in pairs. But the experiment is more than simply a repetition of the optics experiment at microwave frequencies. "As the frequency of microwave radiation is much lower than that of visible light, we were able to fully characterize the effect in all its facets. For example, we can vary the degree of how distinguishable the two photons are and can, therefore, finely control the appearance and disappearance of the effect," explains Christian Lang, a PhD student in the group of Wallraff and first author of the study. "I think it's fair to say that we have produced the so far most complete characterization of the Hong-Ou-Mandel effect," adds Wallraff. "As such, we have now an analytical tool to study microwave radiation in the quantum regime. This may be helpful to characterize non-conventional microwave sources, which are used in several quantum experiments." Beyond these more fundamental aspects, the findings of the ETH physicists may open up new perspectives for practical applications, too. Historically, the Hong-Ou-Mandel effect has been so important as it was one of the earliest experiments that showed how quantum mechanical effects make light do things that cannot be explained within the framework of classical physics. This then led to theoretical and experimental work on how quantum mechanics can help in computation and communication. The new work, which shows one of the quintessential quantum optical effects with microwave photons, can be seen as a first step towards translating these findings into the regime of microwaves, which may offer unique advantages concerning how photons can be generated, manipulated, and detected. "In the longer run, this may lead to novel forms of quantum communication and quantum information processing," says Wallraff.